We spent our last few days in Scotland at a place called the Tulloch Castle Hotel. I had wanted to give my mother a real castle experience, and this one seemed to fit the bill. The building began as a fortress, with turrets and cut outs through which folks used to pour hot oil and the like, and over time it became a manor house. It was just great, although it’s a little frayed at the edges and the staff was a wee bit overmatched. For example, one morning I attempted to deviate from the standard massive Scottish breakfast, which is made up of eggs, haggis, black pudding, tomatoes, beans, mushrooms, and something called a “potato scone.” If you want to order this monstrosity you have to present proof that you’re on a heart transplant waiting list. Anyway, it may be a little late in this trip to start adjusting my portion size, but I asked for a simple plate of eggs, beans, and tomatoes and the very nice server stopped me mid-stream, “just tell me what you DON’T want.” Another time, the water shut off (also mid-stream, as it turns out, while, in perfect sitcom fashion, Janine was completely lathered in the shower) and when I called to the front desk the woman replied, brusquely, “we’ll sort it,” and hung up on me. Ten seconds later, the water was back on. Something strange was going on here. At least they like to think something strange is going on here. One night, a very amiable young fellow tending bar took us on the hotel’s “ghost” tour, gamely offering various tales of the supernatural, including the presence of “orbs” of light and the ghost of a young girl who was said to have met an untimely end in the house. I’m not sure he was persuaded that there are actually any ghosts in the joint (“I believe what I see,” he told us), but we did get a nice tour around the old place, which is complete with an oak paneled study and two stately great rooms (or two great stately rooms), all of which continue to be well used. We also got to sneak up onto the roof, which felt kind of deviant. Even my mother, bless her, trudged up the turret stairs to the top. 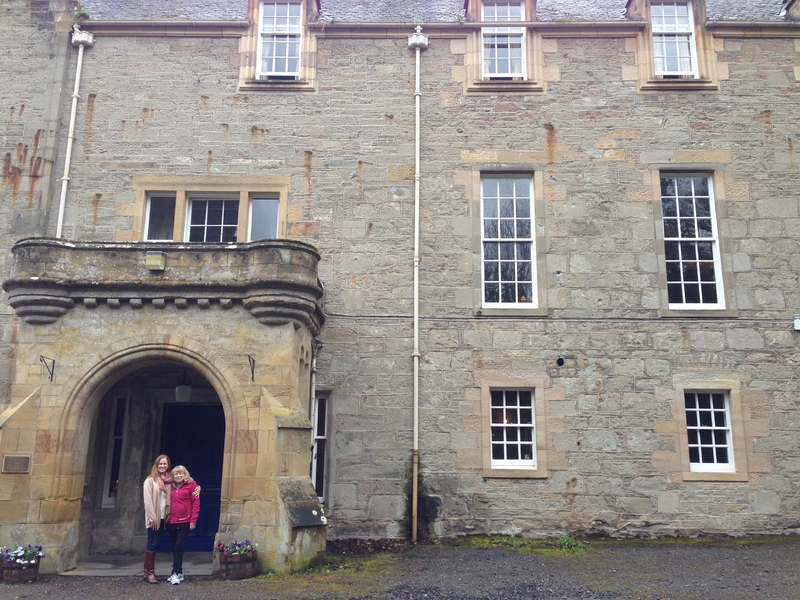 My mom and Janine outside the probably not haunted Tulloch Castle Hotel. Was this Fawlty Towers? Certainly not. For one thing, our room was the bomb – a two bedroom, two bath suite with a fireplace. The place was bigger than many apartments we’ve had and it even had a view of a cliché field of bleating, cuddly, and delicious looking spring lambs. It wasn’t quite Downton Abbey, but Tulloch was old and creaky and completely Scottish, which is worth a lot if you ask me. There was one more very Scottish thing I had to do – play golf. I used to be good, although now I’m quite lousy. Still, how does a golf lover go to Scotland and not play golf? I had always wanted to play St. Andrews, which is said to be the birthplace of golf, but tee times at St. Andrews are taken well in advance. 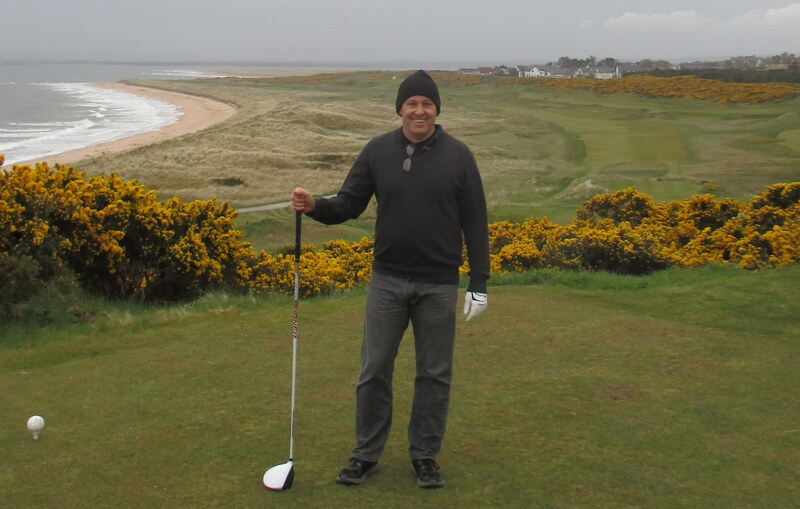 Neverthless, Royal Dornoch is considered by many to be the best course in Scotland, and they were willing to have me. So when people ask me if I’ve played St. Andrews I can tell them no, I’ve played Scotland’s best course, Royal Dornoch. And they’ll yawn. What schmuck goes to Scotland and doesn’t play St. Andrews? This schmuck, thank you very much. Royal Dornoch is a classically beautiful oceanside Scottish golf course all the same, full of things that will swallow your golf ball, including pot bunkers and this stuff called gorse – a lovely golden-flowered hedge covered with spikes. If your golf ball goes in there consider it a donation. Then there’s the weather. There’s an old Scottish saying – “if there’s n’ae wind and n’ae rain, there’s n’ae golf.” Well, applying that logic, there was plenty of golf. When I teed off, the temperature was about 50 with a wind in our face of about twenty miles an hour or so. The first eight holes went straight into that wind, turning each and every shot into an adventure. But at least it wasn’t raining. As soon as we turned around (Scottish “links” courses like Dornoch typically go in one direction for the first nine holes and then turn around and come the other direction for the second nine) we had the wind at our backs, but that’s when the rain hit. It could not have been a more cliché Scottish cold, windy, and wet day if it tried. Braveheart had better weather. At Royal Dornoch, just before the rains hit. By the time it was over I couldn’t feel my feet or my hands, but I was still happy. I spent the day slogging through the Scottish seaside with my trusty caddy, a very helpful and supportive young fellow named Ian, who kept my morale up despite my many visits to the gorse. (I actually ran out of golf balls on the seventeenth hole and, taking a chapter from “Shameful Moments in Sports History” I had to borrow a golf ball from my playing partner.) And yet, on the eighteenth green, there was Ian, trying to give me advice on how to play my hundredth and somethingth shot (“just putt it a wee bit from left to right”). Poor guy. It was like doing a nose job on a cadaver. I didn’t care. I shouldn’t get much sympathy complaining about losing golf balls at Royal Dornoch. Janine continues to remind me that it is unseemly to complain about travel, and of course she’s right. The fact is that I have adored Scotland – its picturesque golf courses, drafty castles, ridiculously beautiful countryside, glorious capital city, and all that haggis. What’s not to like? Edinburgh is a damn near perfect city for tourists. It’s small and manageable, lots of the museums are free, and it seems that there’s a pub on every corner. There are lots of touristy tsotchke stores, but they all seem to sell Scotch whisky, kilts, and scarves, so it’s not too bad. People are generally quite nice, and if we speak slowly and clearly, they can understand our thick American accents without too much trouble. Whereas many big cities have goofy tourist traps like wax museums or Believe-It-Or Not joints, the dorkiest tourist attraction in Edinburgh is something called The Scotch Whisky Experience, which includes a theme park-style trip in a whisky barrel through a virtual distillery, hosted by a moustachioed 19th century hologram. After the ride is over, visitors get a short course in how Scotch is made (complete with scratch and sniff cards – no joke! ), followed by a tasting and a visit to the world’s largest collection of whisky bottles. And you get to keep the tasting glass! It was the best tourist trap I’ve been to in years. Oh, and my favorite part about the place is that they offer tours for schoolchildren! You gotta love Scotland. 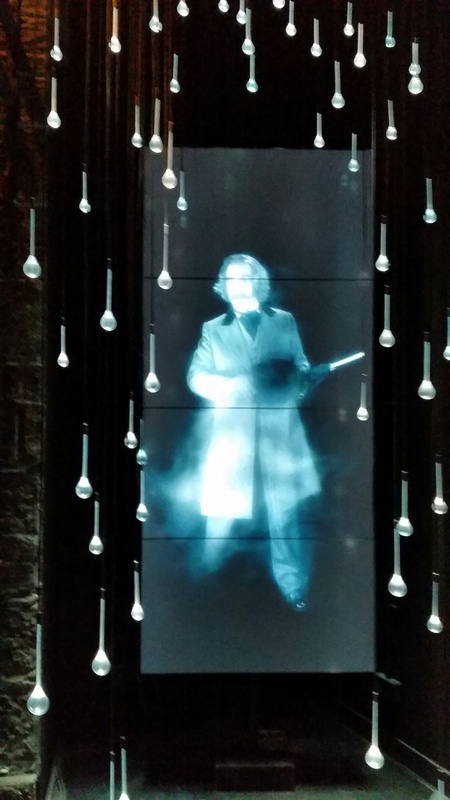 The whisky hologram – goofy as hell, but fun. For all you people who cringe and whinge about the thoughts of haggis, please get over yourselves. As for the vegetarians among you, well, I suppose it’s all meat to your ilk. Anyway, haggis. Basically, they take a bunch of sheep parts, grind them up, add some spices and oatmeal, and boil the whole thing. That may sound a little nasty, but I think it’s delicious. It’s basically like giblet stuffing. If you think of it that way you’ll be just fine. It’s traditionally served with a small mound of pureed parsnips and a pile of mashed potatoes, and sold as “haggis, neeps, and tatties” which sounds like a Scottish strip joint if you ask me. One of the important features of haggis, neeps, and tatties is that you get your meat, your vegetables, and your simple carbohydrates in a package that doesn’t require teeth. I suspect that nursing homes across the country rejoice in this. 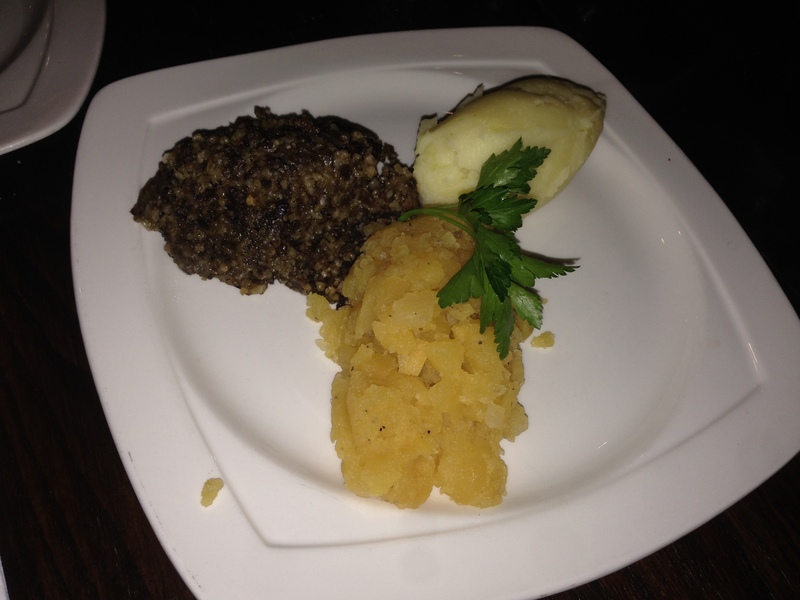 Haggis, Neeps, and Tatties – actually quite yummy. There’s more to Scottish cuisine than haggis. One extremely good example is a place called Timberyard, a gastropubby joint that is up there with the best places we’ve eaten on this trip. Like many hipster havens, the restaurant is a repurposed old warehouse, complete with exposed ductwork and brick, and the ingredients are sourced from local organic farmers who sing their kohlrabi and salsify to sleep. 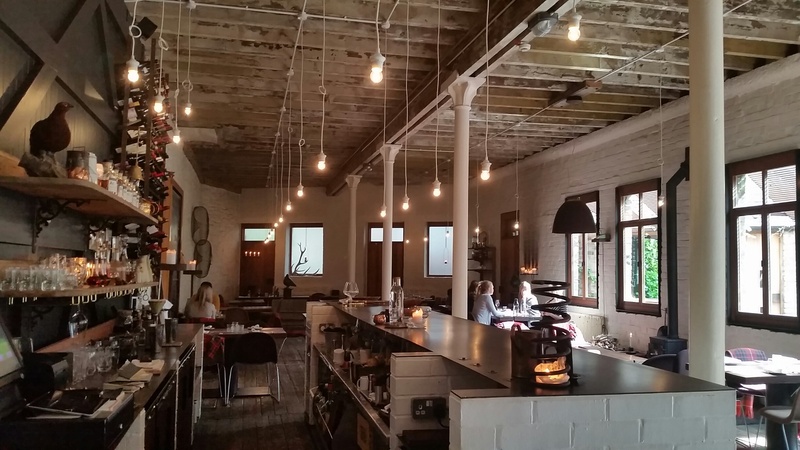 Timberyards – hipster shmabulous food in Edinburgh. There are small batch microbrews and staff with 1920s haircuts and fluffy beards and armloads of tattoos. I know that this makes me shallow, but I always take these to be promising signs. We tucked in. 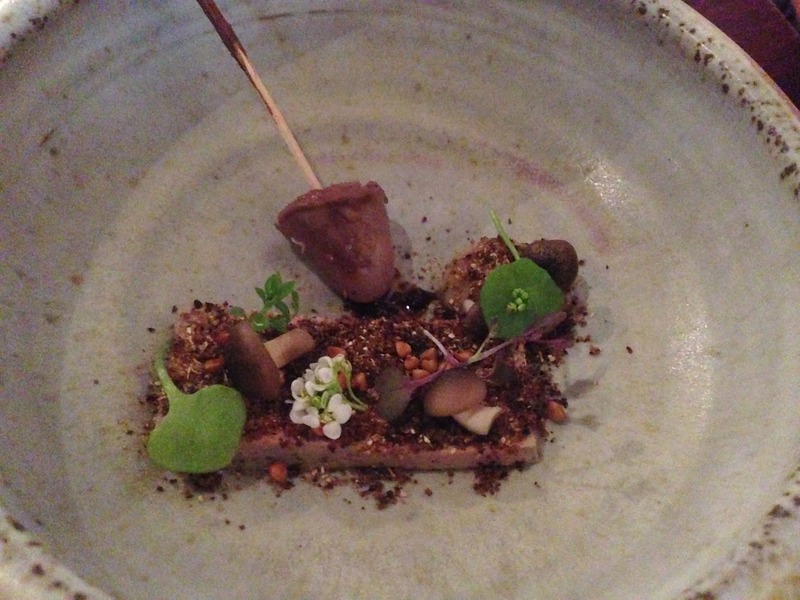 We started with one of those dishes that makes me groan with unctuous, savory ecstasy – a duck pate served with a duck heart speared on a small stick. It was as if Donald Duck’s girlfriend cheated on him and this was all that was left of him – an impaled heart and a pickled liver. Donald Duck’s heart and liver on a plate. Donald’s loss was our gain. We followed with a bright salad of prawn, crab, fennel, mustard leaf, and dill that was happiness and light after all that gothic drama. Then there was a smoked curd topped with thin sliced pickled beets, served with this stuff called ramson, or bear’s garlic, which is a garlicky bulb that grows around here. After that we had a bass with a crispy skin, some kind of yummy foam, and a bit of turnip that was as close to a perfect fish dish as I’ve had. Then came the main event – smoked beef with an arrangement of ingenious accompaniments – braised daikon that had been shaped to look like a lotus root, pickled cauliflower stalks, as well as braised or pickled cabbage and kohlrabi (presumably the ones that were sung to sleep by their farmers). The beef had been smoked and then grilled, but mercifully only just past rare. Getting rare meat in these mad-cow-mad British Isles practically requires a bribe accompanied by a liability waiver. But these tattoo parlor enthusiasts know what they’re doing, and they served up their beef the right way, bless them. I, for one, will be the first to donate to their legal defense fund. My mother has joined us for the last leg of our trip, which has been great fun. She’s been an avid follower of the blog and when she joined us in Argentina in January I asked her to pick another place to meet us, and she chose Scotland. She seems to be having fun. 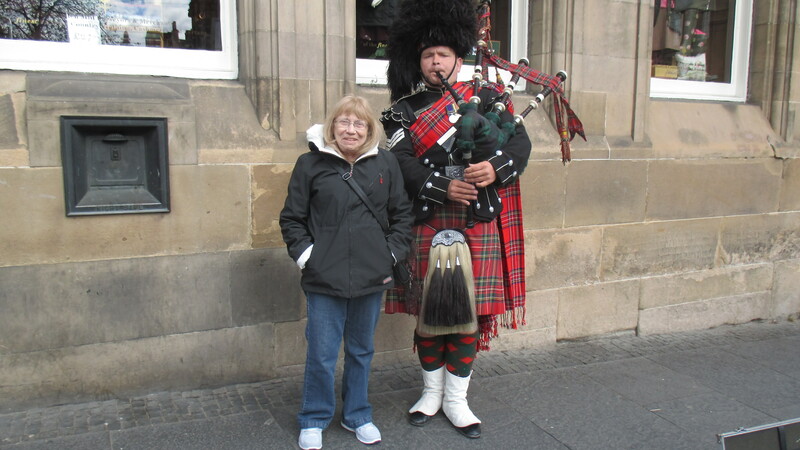 My mother enjoying the company of a Scottish highlander. 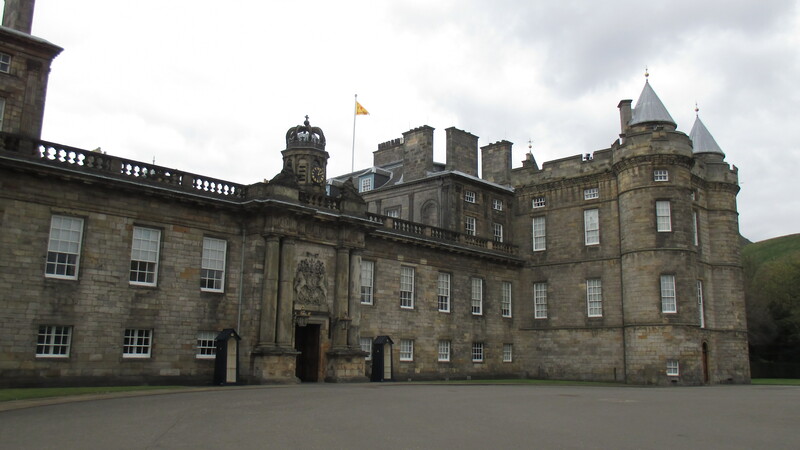 My favorite attraction by far, however, was Holyrood Palace, the Scottish residence of the Queen. She comes up to Edinburgh as part of the Royal Family’s annual summer vacation to Balmoral Castle. Holyrood is an intensely Scottish place, though, and visitors can see the bedroom of Mary Queen of Scots, as well as the anteroom where her private secretary David Rizzio was murdered by Mary’s jealous husband, Lord Darnley. You just can’t make this stuff up. When the Queen is in town, the palace is used for royal events, where she has hosted heads of state, and even Pope Benedict. In the off season, though, for fifteen bucks you can wander the halls where all this history continues to take place. It’s as opulent as you might expect, but it’s still very much a working building, which makes it special. Holyrood Palace, where my mother went missing. The most exciting part of the visit happened when my mother went missing. She’s small, but she’s not that small. I retraced my steps and then re-entered the building from the front and worked my way through the entire building, but I just couldn’t find her. I spoke to several security guards, who issued A.P.B.s on their walkie talkies, but nobody had seen her. I finally did the intelligent thing and sent her a text. Turns out she was off in the Palace Gardens. Who knew? Finally, we had the get the bad taste of Keswick’s Theatre by the Lake out of our mouths, which we did quite effectively with The Curious Incident of the Dog in the Night-Time, a very moving play about autism, based on the novel by Mark Haddon. It’s also on Broadway and it was just nominated for a best play Tony, and I hope it wins. Good heavens, but it’s fun when theater is this good. We will soon be heading north to another castle, near Inverness, because we just can’t get enough of all this Scottish castle stuff. By the way, yesterday was May Day, an official bank holiday here in Scotland, which is meant to commemorate the coming of the warm weather. This must be a joke. We’re freezing our bippies off, but then again, this is Scotland. 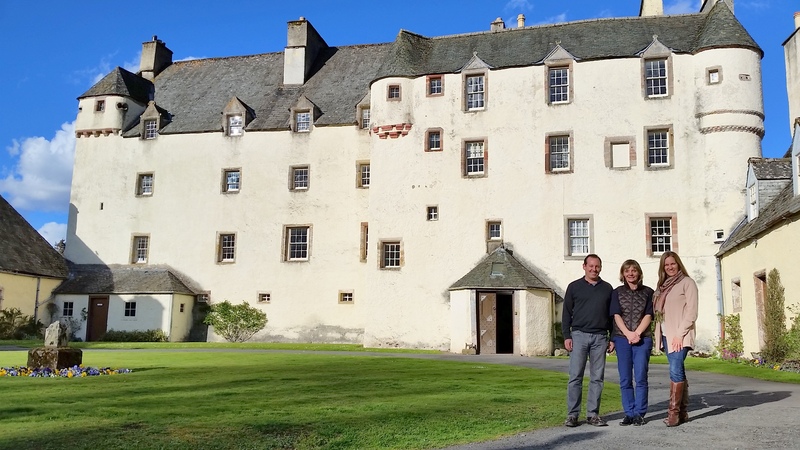 The best place ever – our two days as royalty in Traquair, Scotland. We just left the coolest place on earth, at least if you like old Scottish estates, history, and stuff like that. 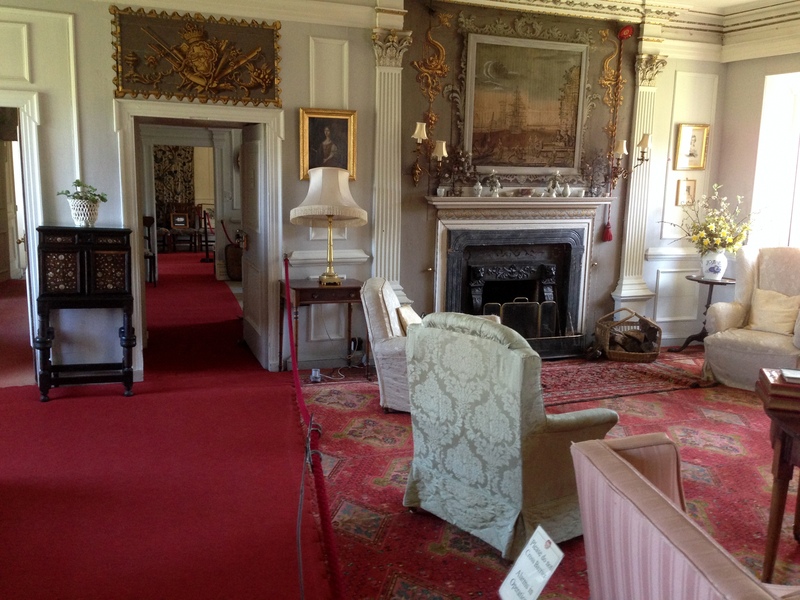 Traquair House in Southern Scotland – maybe my favorite stay of the trip. I’m referring to a little piece of history in the south of Scotland called Traquair House. The oldest part of the house was built in 1107 as a hunting lodge for the kings and queens of Scotland, and it’s considered the oldest inhabited house in Scotland, whatever that means. Over the years, the house was expanded by a long line of family members who have continuously occupied it since 1491. Think about it – this house has been occupied by the same family since the year before Columbus set sail for the New World. The family includes its current resident, the 21st Laird of Traquair, Lady Catherine Maxwell, who, on our first night there, led a tour through the place with the ease and grace of a darned good docent. The fact is that the Maxwells and the Stuarts (who were on the other side of the family tree) probably never had the kind of money that the really really rich people in these parts had, so this is no Versailles. Instead, it’s just an amazingly cool old house that still has its original furnishings, and in addition to being open for tours and running a cute little gift shop, they rent out three rooms to the public. Good for us. Oh, and they have a brewery that has been making beer, on and off, for hundreds of years, fermenting the stuff in three hundred year old oak barrels from four hundred year old recipes that they found in the house’s archives. And this is not the nun’s tinkle that passes for beer in most of the world – this is some serious dark, malty, Scottish ale that weighs in at 7 or 8 percent alcohol. This stuff will warm you so you don’t have to wear leggings with your kilt. Oh, and to ensure that Traquair House is the single greatest accommodation on the planet, it has screamy fast wifi! What more could a person ask for? There is nothing I didn’t like about Traquair. There is a hedge maze in the back. 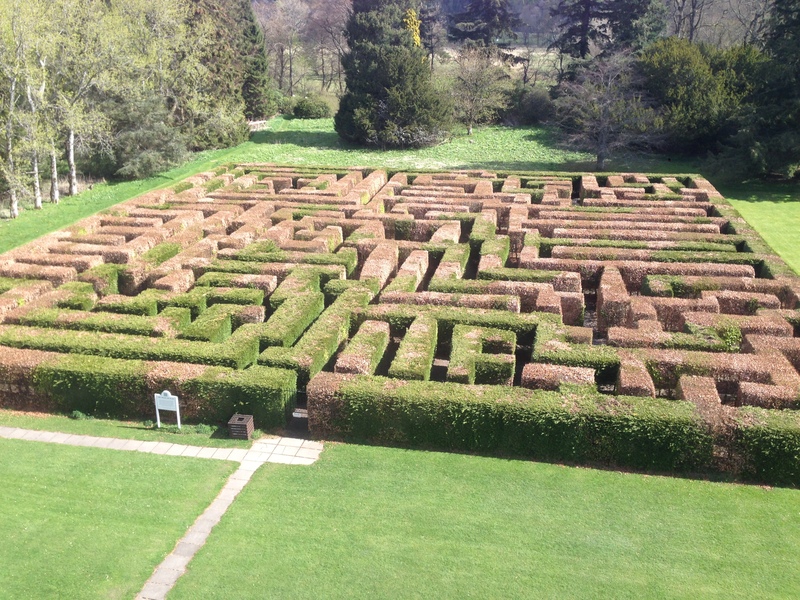 A maze! On our first night, Janine and I decided to give it a go. Within minutes, we were hopelessly lost inside the quarter mile of dead ends when it started raining. Oops. Yet somehow that added to the ambiance, although we were pleased that it soon stopped raining. Our room was big and lovely. Like many old estates, the house has been added on to over the years, and our room is relatively modern, having been completed by 1599. It has a very cool canopy bed and it looks out over the maze at the back of the house. The house itself is open for tours during the day (although our room has a very impressive-looking “private” sign on the door) but when the people go away it’s just us and nine hundred years of history to keep us company. Our room, which becomes the family’s master bedroom in the winter. When we arrived they handed us our keys. Unlike, say, the Marriott, which gives you a cruddy plastic key card, at Traquair you are presented with three ancient skeleton keys. One opened the sitting room in the “new” wing, which was completed in 1695. Another opened our room, and the largest key opened the massive ancient front door to the castle itself. Stay at Traquair and they give you the keys to the castle. 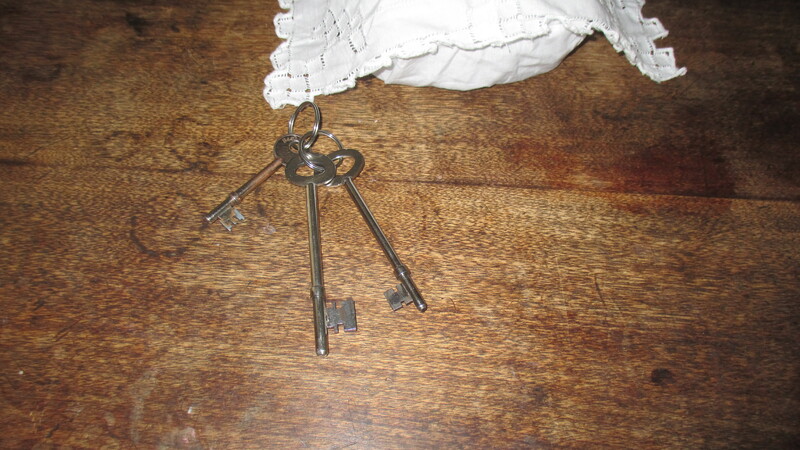 The keys to the castle. No kidding. 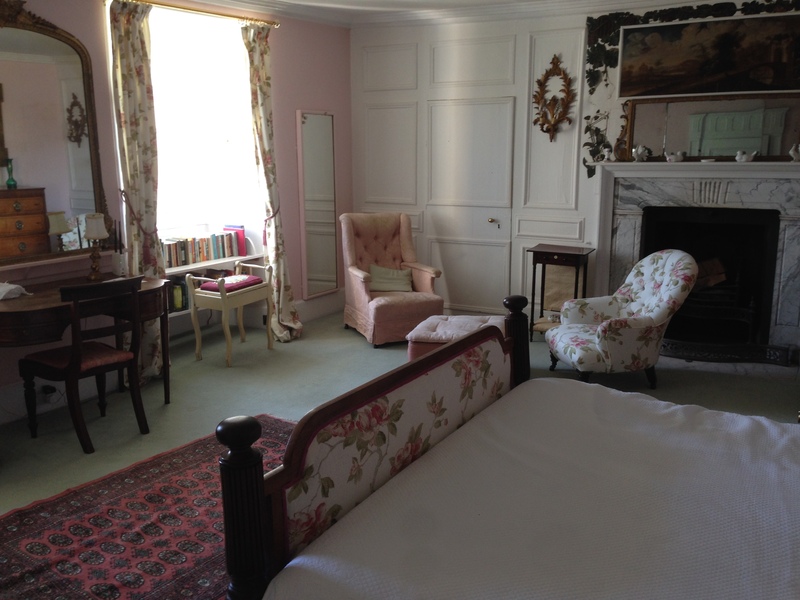 There are two other guest rooms at Traquair, but there were no other guests while we were there, so we had the sitting room to ourselves. We were encouraged to light a fire and avail ourselves of the honor bar, which was well stocked with a variety of bottles, including plenty of the house beer. We were free to roam the house alone in the morning before it was opened to the public, and we tried out the hidden door that was built to allow the house’s priest to escape when it was raided periodically (the family remained steadfastly Catholic even after Catholicism was outlawed). The servant bells that we’ve all seen on Downton Abbey are still in place, and they still work. We spent some time admiring the bedroom where Mary Queen of Scots slept with her newborn son. We marveled at the two libraries, with more than four thousand books that have never left the house, and were amazed that almost all the furnishings are original to the place. The view across the house, just outside our door. The really impressive thing is that the house is still owned and operated by the family. Lady Catherine, her husband and their three children live here in the winter (she and her husband sleep in our room) but they decamp to another house on the property when the house is opened to guests in the spring. She’s an amazingly down to earth woman who seems to fully appreciate the responsibility of keeping a millennium-long legacy going. On our first night in the house, she led a tour for a group of travel agents, and graciously allowed us to crash the party. With Lady Catherine Maxwell, the 21st Laird of Traquair. The whole thing is fabulously unpretentious, and yet it is deeply, amazingly impressive all the same. If you have ever dreamed of staying at a castle or a manor house, do yourself a favor and come here. Before we came to Traquair, we spent a few days in the Lake District in northern England. 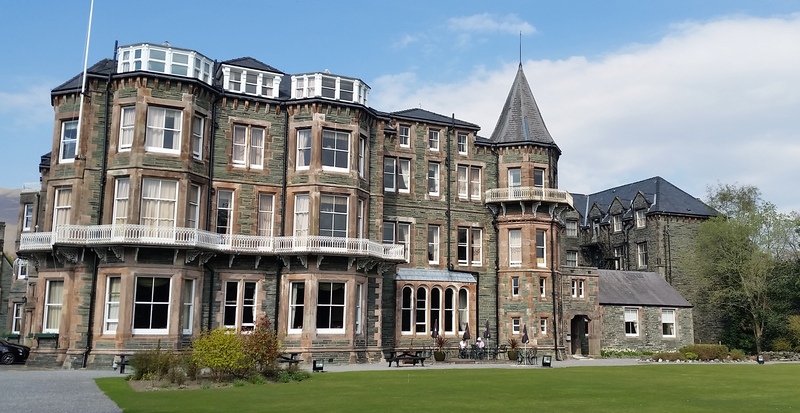 We arrived at the Keswick Country House Hotel (pronounced Kezzik – nothing here is what it seems) in the area that inspired Wordsworth to write his early environmental poetry. The Keswick Hotel is one of those big old hotels that you see in black and white movies. Its claim to fame was a visit by the queen sixty or seventy years ago. We had a nice big room with high ceilings and bay windows that looked onto a large green lawn covered with rabbits. In the morning it was a large green lawn covered with rabbit poop. There was an ornate dining room and a cozy pub, and while the place could use a bit of sprucing up, it was definitely a change of pace from all the airbnb apartments we’ve called home for most of our trip. The Keswick Country House Hotel, where the Queen once stayed! We went to see a play called Lucky Sods, about a couple from Yorkshire who win the lottery. Well, apparently the only thing worse than winning the lottery is a play about winning the lottery. I felt for everyone associated with production, especially the nervous-looking woman dressed in stagehand black I spotted before the performance sitting in the front row with a script in her hand. It turns out that she was nervous for an extremely good reason. Every few minutes she had to throw a life preserver to a cast member, calling out a line to a drowning actor. I’ve seen a lot of theater over the years, but I’ve never seen a cast as a whole forget their lines as much as this lot did. It was so bad that at one point I wondered if the play was performed by a group being treated by a memory loss clinic, or whether it was some kind of innovative treatment for head trauma victims. Perhaps it was the audacious work of an early-onset Alzheimer’s program. If not, it was one of worst things we’ve ever seen, and that’s saying something. Lest you think I’m being hopelessly snobbish, throughout the play, a woman right behind Janine regularly interjected observations like, “It’s not well done!” to her significant other. At the intermission, Janine was desperate to leave, but with such a small theatre I worried that the certain exodus would demoralize the stalwart but sadly overmatched troupe. Well, I was wrong. Every last audience member returned for the second act, bless them. After all, they’re British and they’re polite. We would hardly have been missed. Janine was not pleased with me. She still wants those two hours of her life back. Like most goofy experiences I’ve had during the past nine months, I was secretly fine with it – at least it would be fun to write about.